Please select an option Twin Full Queen King Please select a Size. One night at a fine hotel is wonderful, but 365 nights is even better. Upgrade your sleep with the lightweight comforter of our best-selling premier quality down alternative comforter. Laurel Park Down Alternative Comforter is our best-selling comforter. The ultimate in affordable warmth, each one is packed with just the right amount of 250gsm microfiber fill, which is lightweight enough for summertime use but can easily be just as comfortable in the winter. When you want a clean, classic look, this ultra-plush bedding essential transforms any space into a restful retreat. Choose from one of several color options to coordinate with your bedroom furnishings. The smooth microfiber shell features 14-inch box construction to prevent fill from shifting. 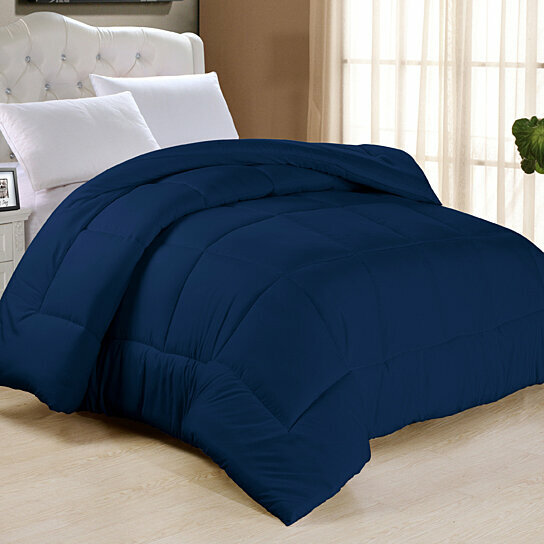 This comforter is soft to the touch, and the down alternative fill is ideal for those with feather allergies. Microfiber is a unique type of material that is made differently than other materials. The original color will not fade or dull after years of use, even if washed often or exposed to sunlight. The material is also unique in that it is very soft and warm, but it also wicks away moisture or humidity, so they can easily be used during winter months as well as during the summer. 100% Polyester Microfiber, Easy Care, Wrinkle and Fade Resistant, Non-iron. Machine wash in cold water. Tumble dry on low. Do not bleach. We accept returns for up to 14 days from the date the order is delivered. Our policy is absolute 100% no-questions-asked, you'll-totally-love-it-or-you-get-all-your-money-back guarantee.